Shore, S., (2015). Autism Asperger Digest August-October 2015. P. 23-40. "I do better when I hear information", said Juanita, a student in my introduction to Autism course at Adelphi University. Miao Miao piped in saying that she needs to see material before she can make sense of it - and that she was grateful for the pictorial nature of the Chinese language as a result. Then George chimed in indicating his need to really do something with his hands in order to experience the material. These comments served as a great prelude to introducing learning styles as it applies to educating students on the autism spectrum. Commonly I am asked to contrast the learning styles of students on the autism spectrum. Based on my own learning experiences, combined with others on the autism spectrum, I believe that it may be more useful to focus on the intensity of the individual's learning proclivities. Similarly to the other characteristics of autism, different styles of receiving, processing and expressing one's mastery of subject material can all be found in the general population. However, with autism, the abilities to engage in these different modalities of learning tend towards the extreme. In the general population people tend to have one or more favored learning modalities with the weaker ones being good enough to get by in school, and later on in the workforce. For example, people who are Visual- Spatial oriented tend to read maps well; yet, can still gather sufficient useful information from the list of directions offered by Google Maps to get where they need to go. Those who are Verbal- Linguistic often can read a map well enough to get where they need to go if a turn by turn list is not available. Howard Gardner's definitions of 8 intelligences (Gardner, 2011) play an important role in understanding how students on the autism spectrum perceive their environment with implications for developing socially inclusive educational environments designed to maximize different learning and processing styles. As a review, these 8 intelligences include Verbal-Linguistic, Mathematical- Logical, Musical, Visual-Spatial, Bodily-Kinesthetic, Interpersonal, Intrapersonal, and Naturalist. Using the following example, let's explore how using Gardner's 8 intelligences allow students to use their strengths in how they acquire information for, process, and demonstrate master of material. For the person with autism or other special needs, accommodations may be necessary for them to employ their strengths in completing assignments. It is the middle of the first trimester of the school year and near the end of the unit on developing story-based reports using a five-paragraph format. 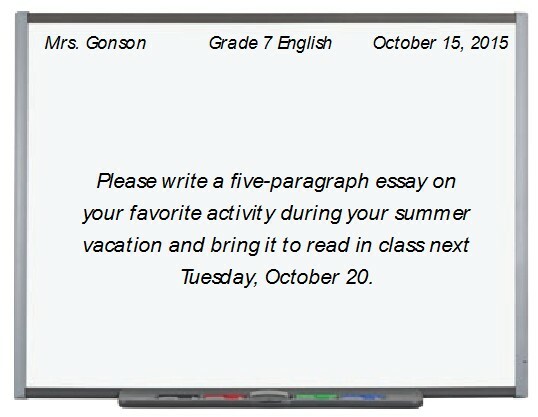 As a summative assessment, Dottie Gonson has written the following assignment on the Smartboard for her 7th grade students to work on during class: Please write a five-paragraph essay on your favorite activity during summer vacation. Having taught for almost three decades, Dottie finds that most students do well with this type of assignment. However, there always seemed to be a few students who had difficulty writing their essays and need additional support. This year, Elijah, a student with autism comes to class on Tuesday with a blank sheet of paper. "I just can't see what to write about. There are just too many ideas swimming around in my head, like the tank of fish I saw at the aquarium last summer. I just don't which one to pick!" Elijah says dejectedly. Suddenly, Dottie remembers a course she took during the previous summer on different styles of learning and wonders if she may be able to help Elijah. Instead of restricting the assignment to the written word, Mrs. Gonson wondered if there was a way for Elijah and other students to focus their work based on how they best receive, process, and demonstrate they have understanding and mastery of the subject material. Additionally, Elijah was not the first student who got stuck on trying to determine which of a number of activities was his favorite to begin with and due to not being able to decide, wrote nothing at all. 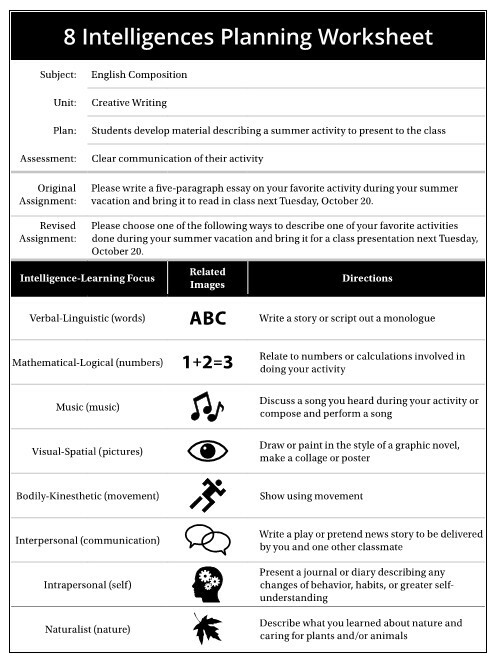 After reviewing her notes from the class on styles of teaching and learning, Dottie develops a worksheet to help herself organize the different learning styles and see how they apply to the writing assignment. 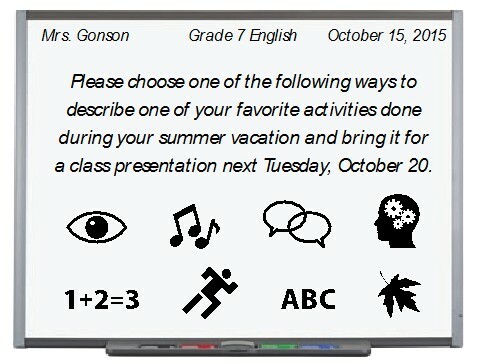 Being a visually based learner, Mrs. Gonson includes a graphic representing each of the styles. By using the 8 Intelligences Planning Worksheet, the lesson is modified and includes the related images used in planning the lesson. These images can also be used to generate discussion on the different types of experiencing, processing, and delivery of information before having the students work on these modalities. Adapting the above worksheet as a poster hanging on the wall will help students remember the different styles. Perhaps a bulletin board can be devoted to each of these styles for students to pin up their work upon completion. A possible extension or enrichment activity might be to work in small groups where each person prepares their work using a different learning modality with their classmates helping along the way. I have enough ADD to sink a battleship. As a result, my handwriting is slow and atrocious. It will be impossible for me to complete the assignment and what I DO write will be impossible to read. Instead of writing out the assignment, how about if I draw a map of the studio? he even came up with his own accommodation! It seemed reasonable to me and I turned him loose on the assignment. The following week the map he drew clearly demonstrated he had mastered the electronic music lab. In fact, it was clear he knew more about the equipment than all the other students. Had I require he write -perhaps insisting that if he hadn't learned how to write then he should drop the course, and then after taking remedial writing courses, he could take my class-I may have failed the student, who in a number of ways, had knowledge of the equipment above and beyond the rest of his classmates. During assessment it is vitally important to have clarity on what is being measured. In my case I was focused on mastery of material and concepts. Therefore, as an educator it was my responsibility to remove the twin barriers of the mechanical act of writing as well as possible cognitive issues. If I were truly interested in this student's ability to write, I could make that a requirement; yet, would have to help him find an alternative means of expressing his ideas. Some common accommodations include typing on a keyboard, answering questions orally, or perhaps using picture exchange communication systems (PECS). Although rarely assessed at the college level, if I were interested in the student's ability in the mechanical aspects of forming letters then having him write by hand would have been a reasonable requirement. Perhaps I would learn some important diagnostic information from his effort. Familiarity with learning styles is important for the success of both the student and the educator. Enabling the student to receive, experience, process, and demonstrate mastery of knowledge and concepts through a favored modality is an important tenet of universal design and good educational practice. Additionally, expanding or stretching student capacities in other learning modalities should also be a goal of the education as long as the engaging in alternate modalities is not used for high stakes assessment or frustrates the student to the point of interfering with learning. Educators from pre-K through higher education will reach more students by expanding the modalities they teach in. A good starting strategy might be to implement additional instructional and learning modality to a lesson. For example, if you are teaching a unit on the weather, where reading, as well as watching a video on the subject is required, what kinesthetic possibilities can be explored to deepen the students' experience on the topic Perhaps not all subjects and lessons are conducive to accessing every learning modality; however, the more strategies are taught, the more rewarding and engaging the subject matter will be for both student and educator. Gardner, H. (2011). Frames of mind: The theory of multiple intelligences. New York, NY: Basic Books. Nonverbal until four and recommended for institutionalization, Dr. Stephen Shore, now professor of special education at Adelphi University, focuses on helping people with autism develop their capacities to their fullest extent possible. Internationally known author, consultant, and presenter, Stephen serves on the boards of several autism-related organizations. For additional information, visit Stephen's website: www.autismasperger.net.